Develop a Customer Service mentality towards both internal and external Customers. Provide leadership strategy sessions for your organization to map out the future of your organization. Align training with your organization's vision. Facilitator-Led, Self-Study, or any other training format that suits your needs. The Senior Manager of the Recruitment Center of a large government Agency wanted to improve the way Recruiters were trained to perform their job tasks for the highly technical and mission-critical functions of this organization. He knew that revising the current training approach would be a major change effort, and wanted to manage the process as effectively as possible. ALESYS consulted with this Senior Manager to identify issues, concerns, and obstacles to the new approach we were recommending for improving the training process. We contributed best practices and strategies for involving key players, Managers, and stakeholders in the revision process. We enabled this Senior Manager to begin the communication of progress towards project milestones in a weekly meeting he conducted with his Senior Leaders. We also developed a concise packet of information about the new approach to training that was shared with key players of the Recruitment Center to ensure everyone understood the goals and timeline of the new training process. The project moved forward very quickly and with much less resistance than other similar projects had encountered. A large government Agency wanted to increase the involvement of their Recruitment Center Managers in coaching the job performance of their Recruiters. No formal training was available to these busy Managers on what their Recruiters should be doing, and the Managers were resistant to attending formal training. ALESYS created a concise, but comprehensive packet of information for these Managers based on the training content we custom-developed for their Recruiters. This packet included a summary of all key concepts, skills, tools, and work processes that were being taught to their staff members, along with observable behaviors, and recommendations and strategies for coaching staff during their job performance. The packet was organized by topic and became a valued management tool very quickly. It could be read and understood by a Manager in not more than two hours. A large government Agency had just completed a project to upgrade the job descriptions of their funded positions. However, the revised documents did not include specific lists of critical tasks that must be performed for each position. A major goal of this office was to develop training for the job functions of certain key positions in their Recruitment Center. Without documented and approved tasks, it was not possible to develop training that would address the performance of specific tasks to standards. ALESYS assigned a team of experienced Researchers to interview Managers and key performers and develop a draft of the critical task list for the key positions. Performance standards for each task were also documented and included on the task lists. This process was very rigorous and produced a detailed list of all tasks, along with the necessary knowledge, skills, and attitudes required for successful performance to the standards. These lists were reviewed carefully by key performers and Managers to verify their completeness and accuracy. When approved, ALESYS used these lists to custom-design and develop the requested training. A large government Agency needed experienced Instructors to facilitate a new training process on recruiting, interviewing, and selection skills for their Recruiters, as well as a separate training program on interviewing skills and working at recruiting events for the subject-matter advisors of the Recruitment Center. ALESYS supplies this Customer with a team of highly experienced Instructors who contribute strong backgrounds in recruiting and interviewing employees. 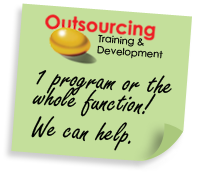 We conduct several sessions each month of these training programs that we custom-developed for this Customer. Our Instructors manage all sessions and provide detailed written feedback to each participant on key skill practices around presenting information at recruiting events and interviewing applicants to make hiring recommendations. Our Instructors have all been certified through ALESYS’ rigorous certification process to manage the learning of each of their participants. They consistently receive the highest ratings possible from participants, with most sessions turning away staff who are on a waiting list for a seat in the training. The Recruitment Center of a large government Agency wanted to assess the knowledge of their Recruiters on various key functions relevant to their job tasks before and after they participated in a new training process. Senior management also wanted some assessment of competence in certain critical skills by the end of the training process. ALESYS assigned an experienced team of Instructional Developers to custom-develop the new training process for this Customer. This team developed a pre- and post-assessment on knowledge and attitude issues that were relevant to this Customer. This assessment took approximately 12 minutes to complete at the beginning and the end of each training session. ALESYS scored each assessment and recorded the information in a database we created to manage the certification process for Recruiters of this Customer. Scores on both assessments were reported to management of the Recruitment Center, along with a recommendation about the certification of each participant. The differences in pre- and post-scores were significant. We then developed several skills-based competency checks on presentation and interviewing skills that were conducted throughout the training process, scored, and reported along with the written assessment scores. While this measurement process was very new to this organization, Recruiters and their Managers take it seriously and work diligently to coach the continuous improvement of the skill sets that are trained. A large government Agency wanted to upgrade their process for preparing staff to join the Recruiting Team within this organization. There was no comprehensive training process, other than a one-day training program on interviewing that did not include skill practice, and some presentations by senior management on what happened at recruiting events. This organization also wanted to increase its emphasis on recruiting diverse applicants, and to more quickly and effectively integrate new team members into the Recruitment Center to speed up the overall hiring process for the organization’s many functional departments. ALESYS assigned a team of highly experienced Instructional Designer/Developers who custom-built a five-day certification training program for the full-time Recruiters of this office. This Instructor-led program included technical skills, as well as skills in learning the specific requirements of the many positions the Recruiters would be processing, where and how to recruit the best talent, planning and managing recruiting events, making presentations at recruiting events, how to screen applicants to find those who would be interviewed, interviewing skills, selecting the best talent, and processing applicants through a rigorous post-selection clearance process. The week-long certification training process included several opportunities for each participant to practice making recruitment presentations and to practice interviewing for various positions. Each practice opportunity included written, verbal, and video-taped feedback so the participants could track their progress in improving their skills. Pre- and post-assessments, pre-work, and action planning were used in this training program. After the certification program for Recruiters was underway, this government Agency asked ALESYS to create a two-day version of the training content suitable for the professional skill development of Subject-Matter Experts in the organization who advise the Recruitment Center on the best talent to hire and conduct many interviews as part of their part-time contribution to the Recruitment Center. This Instructor-led version of the content focuses on interviewing skills and participating at recruiting events. Both programs have made a significant difference in the quality and efficiency of the recruiting process at this important government Agency and in their attrition rates. A large government Agency had been using a one-day training program to teach interview skills to their full-time Recruiters and part-time subject-matter advisors for various functional positions. This program had been developed by a former employee many years ago, and was mostly lecture and stories, with limited content on actual interview techniques. Senior management of the Recruitment Center had decided it was time to upgrade the training and make it practice-rich, leading to certification for performing successfully in the Recruitment Center. As part of a five-day certification training process, ALESYS developed for all the skills performed in the Recruitment Center, we custom-developed approximately three days of Instructor-led training on professional interviewing skills. Each participant had three opportunities to practice their skills with feedback from their peers and ALESYS. This revised approach continues to receive rave reviews from staff and Managers of the Recruitment Center, as they see the improved results of their hire choices. The Recruitment Center of a large government Agency had requested that a new process for training their Recruiters and subject-matter Advisors be custom-developed. Once that project was accomplished, it became clear that the training content would need to be updated on a regular basis to keep it current with the evolution of work processes, forms, and management priorities. ALESYS offered to perform this service for this Customer on an as-needed basis. We update the Instructor and Learner materials, and adjust the delivery of sessions according to the changes that are made. This is an on-going service that ALESYS provides whenever possible. A large government Agency wanted to outsource the management and administration of training materials and training sessions that were part of their new approach to preparing staff to function successfully. They asked ALESYS to perform this outsource service and manage all the details of this training, as part of our partnership to develop the new training process. ALESYS reproduces, stores, and ships all materials for each session of the training we custom-developed for this Customer. We manage all logistics for each session, including managing a database of certification information on each participant who takes the training. We maintain a materials inventory as well. This project spans eight years, with sessions delivered up to three times each month. There have been no problems with any aspects of the administration of this project. A large government Agency initiated a work process improvement project to refine and incorporate best practices into their recruiting, interviewing, and selection functions. They wanted input from private industry and asked for assistance in upgrading the work processes, forms, and procedures relevant to world-class hiring practices. ALESYS identified the best practices that were most practical for this organization to implement, and then custom-designed several processes, forms, and procedures to upgrade how the recruitment, interviewing, and selection of new staff would be accomplished going forward. These new work processes were tested by an internal Customer project team and quickly endorsed as being significant improvements over current practices. They were then incorporated into the new training process developed for the Recruitment Center by the ALESYS Instructional Development Team assigned to this project. To learn more about how ALESYS can partner with you to achieve the results you expect, submit a solution inquiry form or call us at 1.800.758.1071.